There I am, floating like a ballerina in mid-air. Or, I’m running in the woods. Sometimes I am facing dinosaurs. Or, I am defeating a foe. And yes, the ultimate, most embarrassing of them all, standing in front of the classroom not dressed up to par. These are some of the dreams I have dreamt over the years. (The ballerina one was sedation-induced for dental procedures when I was a kid, but it was a dream nonetheless.) I am glad that most of these weird visions of the mind have not come true. Let’s face it; I really don’t have the stamina to outrun a great T-Rex, chasing me up and down the steps of my house after ripping the roof off. No thank you! I have had some strange ones as I am sure you have, too. Thankfully for Joseph, his dream was encouraging. His dream pronounced blessings over his life. It told of promotion and advancement. But, what his dream didn’t tell was the betrayal he would experience. It didn’t tell of the hardships of being ripped away from his family. And, it most certainly didn’t clue him in on feeling like an outsider. His dream did not reveal that though he was faithful in his life, things still weren’t always going to go his way. 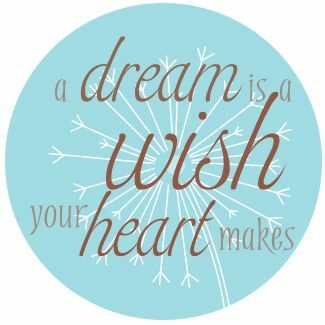 Dreams, whether visions in a sleeping head or goals and aspirations in life have a funny way of doing that. They show you the “what-could-be” without revealing the obstacles that may arise, blocking you from getting to that point. Dreams give you glimpses of “something more” but rarely reveals the work it takes to get there. Life can get pretty yucky sometimes – and, I do mean pretty yucky. Schedules, people, thoughts, and messes get in the way of those aspirations we have. Sometimes, no matter how hard we try we feel like we are really going up a river without a paddle. It’s not only hard but seems nearly impossible! But, I say to you today, “Dream Big Anyhow!” It’s not over until it’s over! Is it a cliché? Yup, but it’s true! Until they say, “Ashes to ashes and dust to dust,” you are still in the running to see great things come to pass. Why sit on the sidelines and watch? It is time to be a participator! You have to be your own dream’s advocate! You have to stand for where you believe God is leading you! Who do you think gave Joseph his dreams? When the children of Israel kept trying to get to their land of promise, who led them there? God did! God wants His people happy and successful. He wants to see them blossom and flourish in all the abilities that He has sown in their lives. He wants them to Dream Big! “I can do all things through Christ which strengtheneth me!” (Philippians 4:13, KJV). Those moments when in a daze and your imagination captures you. You begin to wander around a new world of possibilities; traipsing through fields overgrown with hope and aspiration. A mind laden with dreams is a wonderful place to be. Why not you? Why not now? Why not dream? This makes me wonder at one of our most familiar Bible dream stories. Did Joseph’s brothers ever have a dream? I’m not talking about visions like Joseph himself experienced, but did they hope for something beyond their reality? Did their hopes mixed with Joseph’s ability to dream and see more incite their jealousy and bitterness? Hmmm . . . .
It’s hard to see others reaching for more when you can’t see yourself doing the same. “Hope deferred makes the heart sick,” (Proverbs 13:12a, NASB). When the heart longs for something that doesn’t ever seem to grow and come to fruition, it can leave a feeling of brokenness on the inside. When that hurt takes over it can shadow one’s thinking, distorting the truth, relationships and life. “But desire fulfilled is a tree of life,” (Proverbs 13:12b, NASB). When that thing that is hoped for comes to pass it lifts the soul to the higher bringing forth healing. But, if hope is given up on; if dreams are vanquished so goes with it that genuine aspiration to see life for more beyond the here and now. Don’t be content to just sit on the sidelines and watch others dream! That’s no life when God designed you for more! You have it in you to do the same! Don’t give up on dreaming! Don’t give up on hope! Jesse Jackson was once quoted as saying, “Keep hope alive,” (American Rhetoric). Let it breathe in you and through you. Let it grow until it produces the fruit of what the seed inside you aspires for. Nurture it that it does not die off. It doesn’t matter if you can’t see it in the natural right this minute. Romans 8:24 reminds us, “Hope that is seen is not hope.” If you keep nurturing your dreams; if you “Keep hope alive,” you will keep moving closer and closer to the goal you are stretching out for. You have to keep climbing for it until you reach your summit. You have to keep dreaming. Don’t end up in bitterness and jealousy, with no life like Joseph’s brothers. They ended up wanting to get rid of he who did dream. That’s no life. That’s not a way to live. God designed us for so much more. We are made to be overcomers. We are built to be conquerors. We have hopes and dreams on the inside that waiting to be manifested. The world is waiting for that special thing God planted in you! 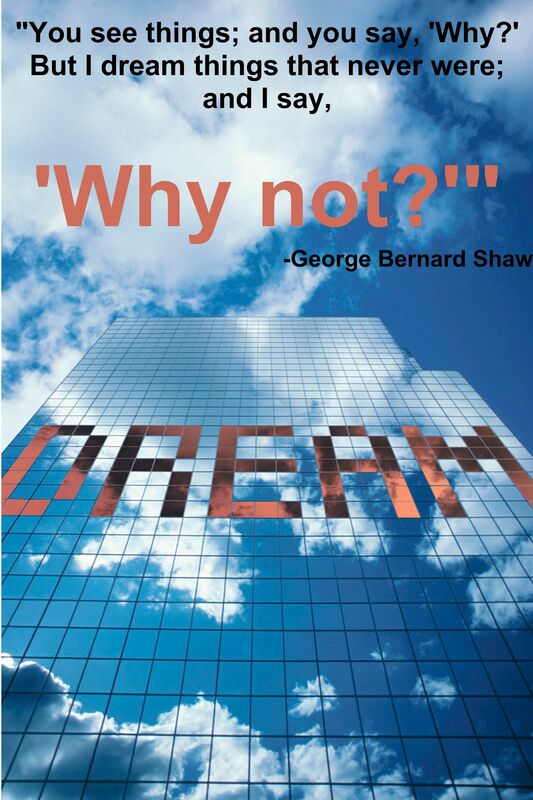 Get with George Bernard Shaw’s mentality and say, “Why not?” Why not me? Why not now? Your life was meant for more! Hope for it. Dream about it! Don’t give up on it! Be blessed because it feels good to dream 🙂 !